Twin Oaks Middle School, part of the Prior Lake-Savage Area School District flipped the switch on its 20 kW solar project which is anticipated to save nearly $100K in electricity costs over the next 25 years. The system will not only save energy dollars but also provide science learning opportunities for students and help to meet the district’s sustainability goals. IPS Solar installed the project and financial contributions were made by the Mdewakanton Sioux community. The school will have no upfront costs to install the projects and will pay lower electricity rates over the next 15-20 years. Construction began in September and was completed on time and on budget. 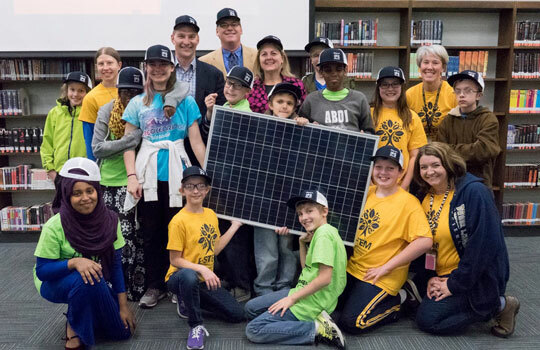 IPS Solar is also launched its Sunrise Program, focused on creating curriculums designed for science classes in elementary, middle, and high school. “We not only want to provide safe, clean and affordable energy for these schools, but the tools to connect the students to the science behind their own school’s system,” states Michael Cartwright, former physics teacher and education director at IPS Solar. Learn More about the Sunrise Program.